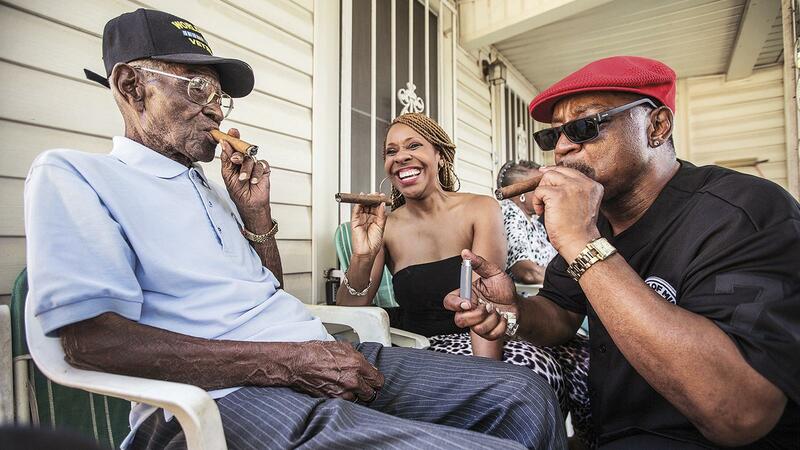 A few weeks before his 109th birthday, Richard Overton (left) smoked cigars with Donna Shorts and Martin Wilford in Austin, Texas. Birthday number 109 began as a typical morning for Richard A. Overton. He rose early (3:00 a.m. on this particular day), brewed some coffee, and went to the front porch of his home in East Austin, Texas. The temperature was in the 60s, not bad for Texas hill country in mid spring, and he lit a cigar, the first of about a dozen he would smoke that day. Business as usual for Overton. But when the sun came up, the day got busy for the oldest living U.S. veteran of the Second World War. His phone began ringing more than normal. "People wishing me a happy birthday," he said to one reporter. Then it was time for cake with Gov. Greg Abbott of Texas and his first lady, Cecilia, in the Conservatory Room at the governor's mansion in nearby Austin. Everyone seems to want to wish Overton well these days. He's a man of stunning constitution, with a mind that's sharp and clear. Overton is proud of the fact that he still drives himself on occasion in his '73 Ford pickup truck, and remains active around the house, doing a little yard work here and there. "You've got to stir around a lot. Your muscles get dry, your blood gets slow. You need to get up and move around," he advises. "If you keep your muscles sluggish, it slows your blood down." Life has been anything but slow for Overton, who was born in St. Mary's Colony, Texas, outside of Austin, on May 11, 1906. It was a community founded after emancipation by black dryland farmers who wouldn't get waterline service until 1979. The Wright Brothers had taken their inaugural flight only three years earlier, and the world had yet to see its first world war. It was the second of those conflicts in which Overton's destiny lay, so far away from his hometown. He was drafted into the U.S. Army and served from 1942 through 1945, fighting for the all-black 1887th Engineer Aviation Battalion. His service took him to the South Pacific, where the United States would fight some of its bloodiest battles, and his group built airfields to fight the Japanese as the United States hopped ever closer to the Japanese mainland. His boots hit the beaches of Guam, Hawaii, Palau and the volcanic Japanese island of Iwo Jima, where one of the fiercest battles in the history of war took place. In five weeks, more than 6,800 Americans lost their lives. "He arrived in Iwo Jima a few days after the main battle," says his friend Allen Bergeron, chairman of Honor Flight Austin. "He was part of the body detail. He says that's where the water along the beach turned to blood." Bergeron says Overton had 30 confirmed kills during the war, but he emerged from his service uninjured. "Bullets went behind me, above me, why they didn't hit me, I don't know," says Overton. The war ended in September 1945, and in October Overton was honorably discharged with the rank of sergeant. Back in Austin, he returned to his job at a furniture store and built his own home. There are burdens to living such long lives. He married twice, but outlived both wives. He never had children. And there are all those soldiers who fought alongside him who didn't come home. "I lost a lot of my friends," he says. But the times have been good of late. He began to make news when Honor Flight Austin flew him to Washington, D.C. on Veteran's Day in 2013 for a meeting with President Obama, who shook his hand in the White House and recognized his service to his country in a speech. Today, Overton has a younger girlfriend, a woman of 90, and he's become a bit of a local celebrity as people marvel at his stamina. He smokes cigars every day, and prefers them mild and on the smaller side. He doesn't enjoy the fat cigar trend, doesn't like a cigar that's too big to hold comfortably in your mouth. His go-to smoke is a machine-made cigar called a Tampa Sweet, a bargain brand that sells for about 40 cents a cigar. He had a doctor once who told him to drop the cigars. He ignored the advice. "I smoke 12 a day," he says, "but I don't inhale them. It's the good taste. Let your lungs stay clean." Overton not only loves his cigars, but he has a taste for whiskey. He drank much of it as a younger man ("I used to drink a lot," he says frankly), but today puts only the occasional splash in a cup of coffee, a cocktail he claims has a beneficial effect. "You put a taste of whiskey in your coffee in the morning," he advises. "It's like medicine." He has had plenty of milk over the years, which he credits for his strong bones, and he celebrates with Jim Beam and 7-Up. Bergeron says that Overton had a few on his birthday. As for regular prescriptions, perhaps something to deal with the ailments one must certainly have after nearly 11 decades on the planet? "I ain't dead, I ain't sick. I don't take medicine," he says. "I'm still driving, still getting around, lying and telling the truth sometimes," he says with a chuckle. And still sitting on a porch he made with his own hands, still smoking cigar after well-earned cigar.